When you’re looking for aftermarket alloy wheels, you can increase the diameter and width from the original factory supplied set if you like and there will usually be a variety of offsets that will fit, but you must get a wheel that matches the original PCD of 5x114. We would recommend either 17” or 18” diameter, as this will look great, allow for big brake clearance and let you fit the most suitable tyre sizes for increases in power. How big and wide you go for depends on the look you’re after, what tyres you want to fit and whether you just want a simple straightforward bolt-on fit, or you’re prepared to put some work into adapting the suspension and bodywork to suit. We can supply wheels in a big variety of sizes, from exact replacements for your originals, up to huge, wide and deep dish drift style wheels. 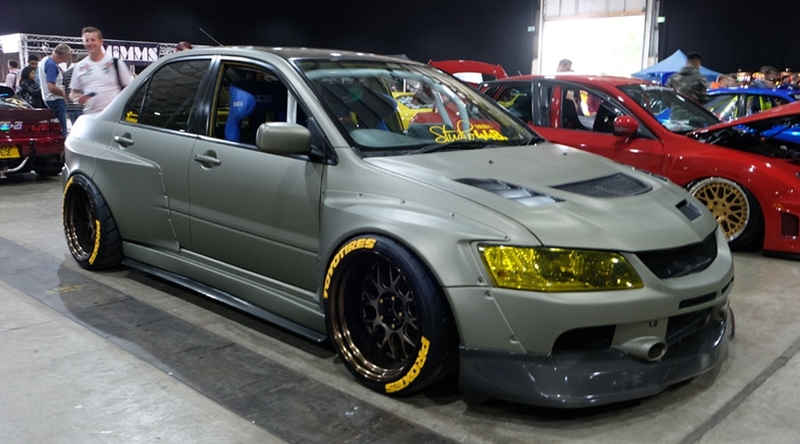 Here’s some examples of different sizes and styles of Rota wheels fitted to the Mitsubishi Evo to give you an idea of the look and range of what’s available. 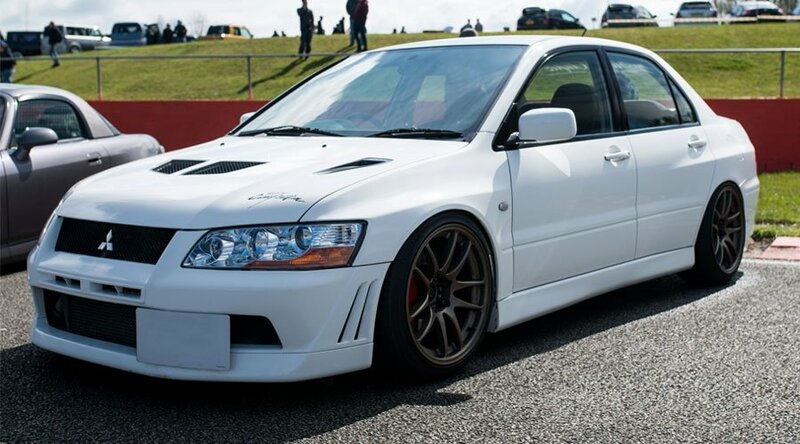 You can find direct links to the Work wheels to fit the Mitsubishi Evo at the bottom of this page. If you’re still not sure of what you need, just give us a call or drop us a message and we’ll be happy to help. All of the sizes below will go straight onto Evo V to 9. Requiring no arch/bodywork. Ideal for someone that wants a lightweight, stock replacement wheel. 9 & 9.5J will give you the “drift” wheels with concave spokes, you’ll require an arch roll to fit these sizes.. The smaller section tyre and more negative camber you run, the easier they’ll fit. Front suspension clearance is the only other issue, fitment varies hugely, but you may need from a 5mm slip on spacer, to a 15mm bolt on to clear the suspension inboard. You will only be able to determine this with trial fitment, but an effective ET15 will clear most suspension. Lower offsets with 9.5J and wider are a popular fit with an arch pull front and rear. The wider the wheel and tyre, the more you’ll need to pull the arch. 10J is the biggest possible on the front with a wing pull and allows you to run a nice big tyre. 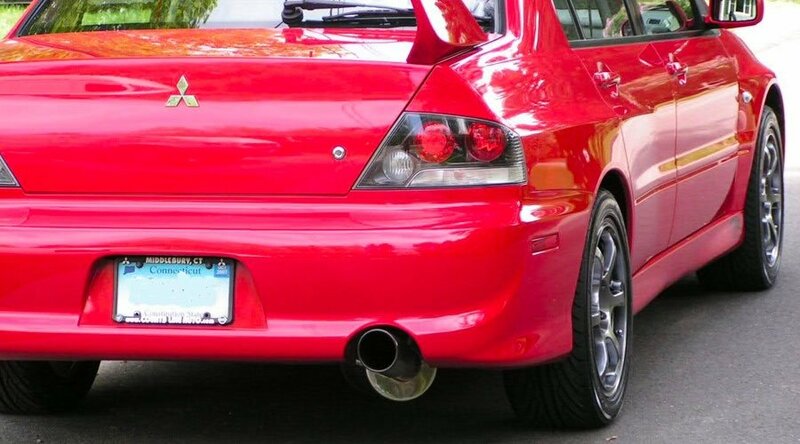 Any wider on the rear will require either a large flare and negative camber, or overfenders. We can also help with wheel fitment for custom arches/bodykits and supply any wheel spacers needed. Driftworks have a huge array of wheels available in-store including designs from the likes of WORK Wheels, JR, Rota and Cosmis.